to establish requirements and best practices within the industry and to help investment managers implement them in practice. The INREV Guidelines are presented in an online format, allowing visitors to easily navigate and search through and view tailored guidelines for example for open end funds. 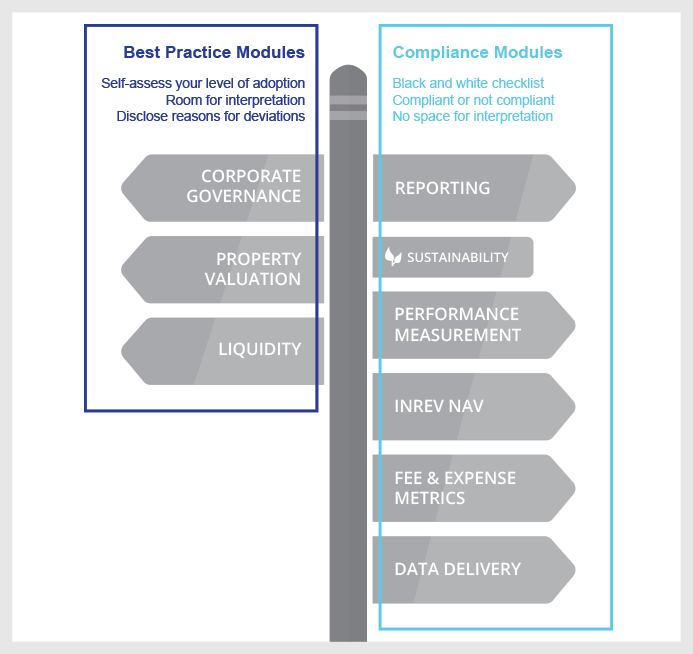 The INREV Guidelines are organised into eight modules. Best practices have been developed by INREV to enable investors and investment managers to design vehicle products with an effective corporate governance framework aligned with industry best practices and at the same time relevant to specific needs. Investment managers should evaluate themselves against such best practice frameworks and disclose their level of adoption. Tools and examples are meant to assist in the application of the INREV Guidelines. Tools support market participants in assessing specific situations and in complying efficiently with INREV Guidelines and standards. Examples serve as a pattern to be followed by market participants to illustrate a certain standard. INREV definitions (‘Global Definitions’) were developed to achieve consistency of meaning and terminology within the non-listed real estate industry. Global definitions are being created via the collaboration with the NCREIF PREA Reporting Standards. They are gradually replacing the INREV Definitions.